This ASCD Study Guide is designed to enhance your understanding and application of the information contained in The Best Class You Never Taught, an ASCD book written by Alexis Wiggins and published in September 2017. Most of the questions contained in this study guide are ones you can think about on your own, but you might consider pairing with a colleague or forming a study group with others who have read (or are reading) The Best Class You Never Taught. What was one of your best professional development experiences? What made it so good or relevant? In your mind, who does more of the "heavy lifting" in preparation for class time, you or the students? Why do you think that is? Which skills or habits of mind do you think are the most important for students to have mastered by the time they graduate high school? Jot down a brief list. Review your list and reflect on how often students have the opportunity to practice, get feedback on, and be assessed on those skills or habits of mind in your class: "regularly," "occasionally," or "almost never/never." Whatever the answer, reflect on why you think that is. Have you ever assigned a group grade for a class discussion? If so, what was the result? If not, what questions or concerns do you have about potentially using a group grade for discussions? If we want students to be effective collaborators, why do we rarely or never give feedback on or assess the quality of their collaboration skills (as opposed to giving feedback on or assessing the quality of the product they create or collaborate on together)? What kind of team, department, school, district, state, or national system are you working in? Is it one that would be open to and supportive of a classroom philosophy like Spider Web Discussion, or would there be challenges to overcome? If more college educators, like Harvard University's Dr. Eric Mazur, are advocating for teaching and learning methods like Spider Web Discussion by arguing that students are not prepared for university or a career if they cannot question, discuss, and collaborate effectively, then what prevents K–12 teachers from implementing them in their courses regularly? Try a little experiment: Out of a typical class period that you teach, what percentage would you guess you speak during the class (students listening to you) and what percentage would you say that students are speaking (you listening to them)? Write it down as a total that adds up to 100% (e.g., "In an average class, I probably speak 60% of the time, and the students probably speak about 40%"). Now, either video record one of your next classes or have a trusted administrator, coach, or colleague sit in and document the speaking times of both you and your students. When you examine the times, do they match up with what you thought or are they different, like Alec's? What do you make of the results? Does letting go and allowing students to speak a majority of a given class period make you nervous? Why or why not? Do you think it's important to have a rubric for class discussion? Why or why not? Although great discussions can happen without a rubric, what are the advantages of using a simple rubric with clear, collective goals for all participants? You want to spark an enthusiastic, engaged response from students during the first discussion; given this, what might be an age- and subject-appropriate reading, essential question, or multimedia text for your students? Consider the components of the first Spider Web Discussion: designing the rubric; choosing the topic or text; introducing the method to the students (setting a time and explaining the teacher's role); and debriefing, feedback, and students' self-assessment after the discussion. Which components are you the most apprehensive about? How might you plan those components, either by yourself or with a colleague, so that you feel less apprehensive? Consider the five nonnegotiables in Spider Web Discussion (p. 35): participants gather in a circle or oval where they can see everyone face-to-face; the teacher provides a clear rubric for students to easily assess their discussion; the teacher remains silent and sits outside the circle in a chair throughout the discussion time; the teacher debriefs the discussion and its process with the students afterward (5–10 minutes); and the teacher and students agree on a group grade that doesn't "count." How do each of these work to achieve the stated goal of making students stronger, more autonomous communicators and collaborators? Consider the key findings of Google's Project Aristotle: the most effective teams at the company were those that demonstrated equal talk time among all members and those in which participants felt a sense of emotional safety and empathy. How might these findings apply to education? Do you believe sustained student-led discussion has a place in your classroom? Why or why not? If you have given the method a try, what were the students' reactions? What was yours? What did you learn from the experience? When the data supports peer discussion as an effective method for learning, why do many teachers fall back on the classic transmission mode—teacher at the front of the room, delivering the lesson—as the primary teaching strategy (especially in high school)? Consider a time in your adult life when you learned how to do something new (e.g., speak a language, learn a dance move, install a ceiling fan, scuba dive). What was the process you went through in order to acquire that knowledge and skill? Could you have done it, or done it as well, primarily from a lecture? Consider how varied the experience likely was: watching or listening to someone else do it, trying it yourself, learning from your mistakes, using a variety of learning modes (written, visual, aural, tactile), and asking questions and checking in frequently with the instructor or expert. How can you apply some of the lessons and insights from your adult learning experience to your students' learning? What might a Spider Web Discussion look like in your particular class, given your students and subject matter? Is there a specific unit that would lend itself nicely to the method? What specific population challenges are you facing (e.g., large class sizes, students with low-level language skills in the target language, students of widely varying abilities in the same class). What are some practical ways you could address them the way Nellie Bridge has, as described in this chapter's "Voices from the Field" (p. 65)? Think for a minute about yourself as a young student and whether you were more of a "shy kid" or a "superstar" in terms of discussion. How might your own experience as a student affect your thinking about Spider Web Discussion? Why is it that the most and least reticent students usually have the hardest time with Spider Web Discussion initially? How do traditional grading and assessment practices play into this phenomenon? How often do you assess students on their conversation or listening skills? On how they build on ideas or arguments? On how well they advance the conversation? On the depth and insight of their questions? On how those questions reveal new avenues of discussion? Are your students aware that these are key goals in a discussion-based classroom? What's the difference between being a discussion "superstar" and a discussion leader? Why is it important that we, and our students, understand the distinction? What's one action you could take as teacher in your next class discussion to support a superstar? A shy kid? Is the deepest learning always done when we are pushed outside our comfort zones? How do we find the balance—pushing students outside the boundary of their comfort zones, but not over the edge? Think of a time when you had a difficult or disruptive student. How were you similar to that student (either in the present or past)? How were you different from him or her (present or past)? Reflect on a time in which a difficult or challenging student surprised you in a positive way. What did you learn? Think of a student who is a consistent challenge to you right now. Ask yourself, "What else might be going on here?" What are some immediate steps you can take to make your class more inviting and friendly to those students that need to move, make noise, and expend a lot of energy? What are ways—within Spider Web Discussion or outside it—that you can harness that energy "for good"? How might your demographic (e.g., age, gender, race, ethnicity, religion, language, social class, education) be a barrier between you and your students? How can you get to know and understand them better and build trust, given your perceived differences? What is the end goal? What do I want to achieve with these students and this discussion method? What kind of personalities, background experience, and life stories are in play here? Who is clashing or disrupting, and why do I think that might be? Given the answers to the above two questions, what is the best way forward? What immediate steps can I take to build bridges and keep discussion calm, productive, and focused on the goals? If we want students to collaborate authentically, why don't we design work that really assesses that skill? How do you communicate to your students what is most important in their learning? How do you model it for them? Talk to your administration about possibly shadowing a student for a day and find out more at http://shadowastudent.org. What could you gain from this experience? Think back to a time you felt powerless as a working professional or a student. How did it feel to know your fate was in someone else's hands, and that someone didn't necessarily know or understand your needs? How might this be similar to some of your students? How can grades be tools? How can they be weapons? Over the years, what are some of the benefits you have seen in your classes from general class discussion? If you don't have any experience with class discussion, what are some of the benefits you'd expect to see (that have or haven't already been listed in this chapter)? What specific personal habits or notions do you have about teaching and learning that you may need to confront in order to adopt Spider Web Discussion into your repertoire (e.g., power dynamics, personal preferences for subject matter or teaching style, your own experience as a student)? Reflect on your students, the relationships they have with one another, and the relationships they have with you. What might be some of the barriers to creating greater empathy and autonomy? Sometimes teachers embrace discussion for their students but shy away from it themselves, feeling anxious or uncertain about discussion with their fellow faculty. How might you feel if Spider Web Discussion were used in a faculty meeting? How do you think other colleagues and administrators would react? What could be some of the potential benefits of faculty using the method? Reflect on your current comfort level, your student and parent population, and the system in which you teach. What are three initial steps you could take this week toward using Spider Web Discussion in your classes? Spider Web Discussion is easier when you aren't the only teacher using it. Who might be your allies on the faculty or administration? Who can be a critical friend and support system as you try it out and hone it? Effective, timely feedback is good for you as well as your students. How can you solicit both face-to-face and anonymous feedback on Spider Web Discussion from your students so they know you value their experience and insights? 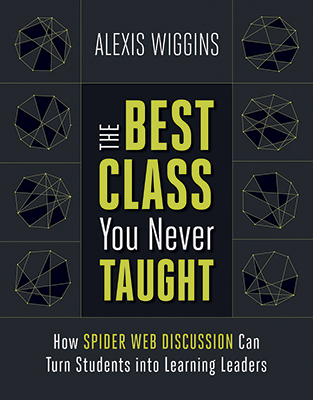 The Best Class You Never Taught: How Spider Web Discussion Can Turn Students into Learning Leaders was written by Alexis Wiggins. This 160-page, 7" x 9" book (Stock #117017; ISBN-13: 978-1-4166-2468-4) is available from ASCD for $22.36 (ASCD member) or $27.95 (nonmember). Copyright © 2017 by Alexis Wiggins. To order a copy, call ASCD at 1-800-933-2723 (in Virginia 1-703-578-9600) and press 2 for the Service Center. Or buy the book from ASCD's Online Store. Copyright © 2017 by Alexis Wiggins. All rights reserved. No part of this publication—including the drawings, graphs, illustrations, or chapters, except for brief quotations in critical reviews or articles—may be reproduced or transmitted in any form or by any means, electronic or mechanical, including photocopy, recording, or any information storage and retrieval system, without permission from ASCD.